While many players often visit an online casino for the latest and greatest slot games, some players are highly attracted to scratch cards. Spamalot was originally a scratch card that had huge success and this is one of the factors that lead to the development of the Monty Python’s Spamalot slot game. This slot was developed by Playtech and offers 20 paylines, wild symbols, a free spins feature, and several bonus features. For players who are looking to score a big progressive jackpot, this is the game to choose. In addition to the top fixed jackpot of 5000 cons, players can also win one of two progressive jackpot prizes. These are known as The Holy Grail and The Slightly Less Holy Grail. Both of these jackpot prizes will offer huge payouts to lucky players. In addition to the progressive opportunities, Monty Python’s Spamalot has four different bonus rounds. Each of these bonus rounds will offer players various ways to instantly win cash rewards. 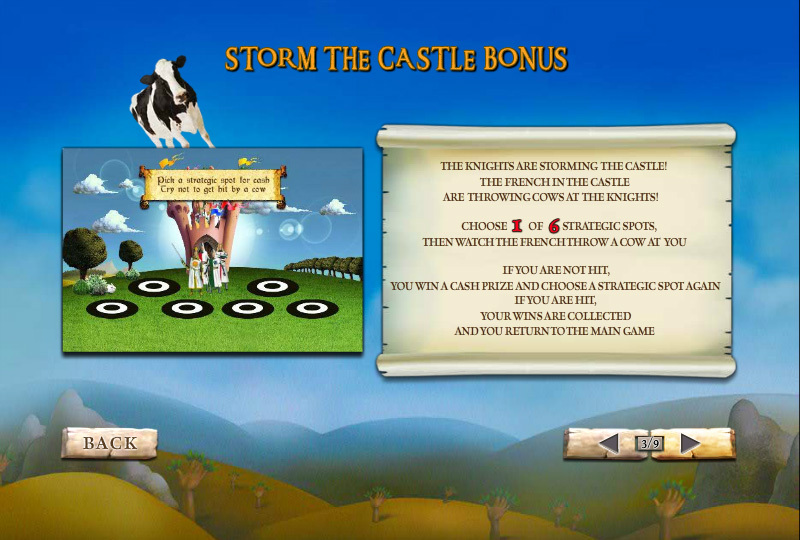 The Storm the Castle Bonus is a second screen round that will allow players to select spots on the screen to reveal cash awards. This is a fun bonus round because as players make their selections, cows are hurled at the knights from the top of the castle. If the cows crush the knight, the bonus round will end. However, if players can avoid these falling cows, they can carry on and keep selecting spots on the screen for some great payouts. 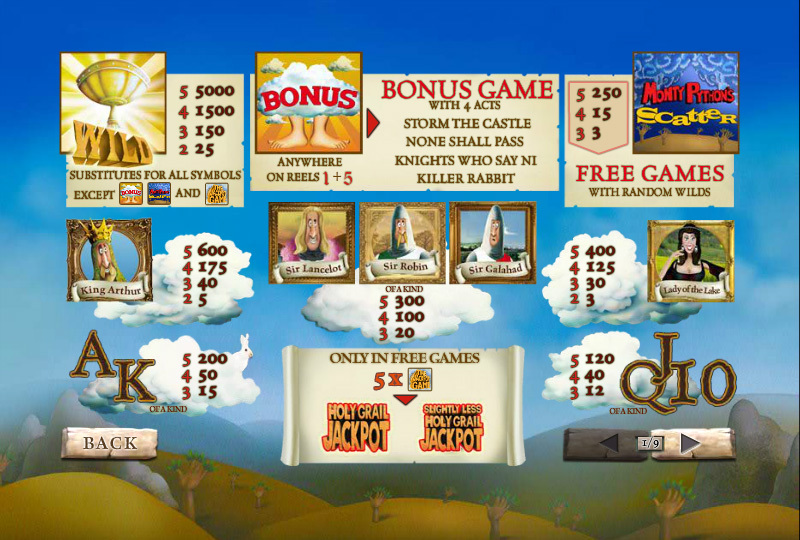 Play Spamalot at Casino.com today! Another bonus round is the None Shall Pass Bonus. 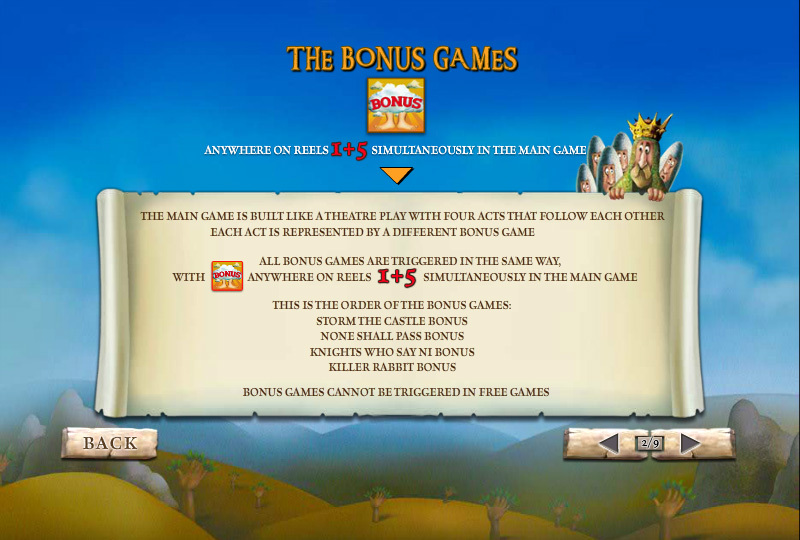 This bonus is interactive and will require players to help the King remove limbs from a knight. Each time a limb is removed, players will receive a reward. The bonus round starts with a 5 times multiplier ad this is increased each time a limb is successfully removed. The other two bonus rounds are also interactive and require players to accomplish different tasks to receive their cash rewards. While many players will think that four bonus rounds and two progressive is amazing enough. There is even more offered in this game. There is a Free Spins Feature that can also help boost the bankroll. 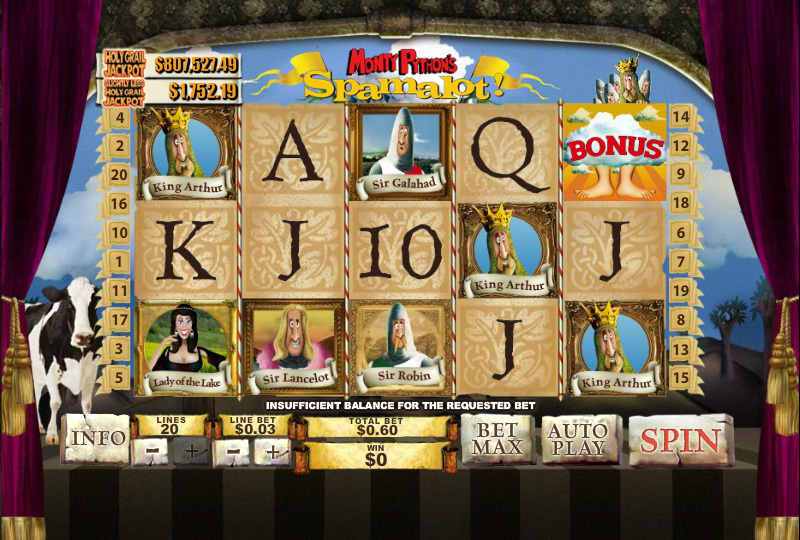 If players can get three Spamalot symbols on the reels, they will be granted 10 free spins. 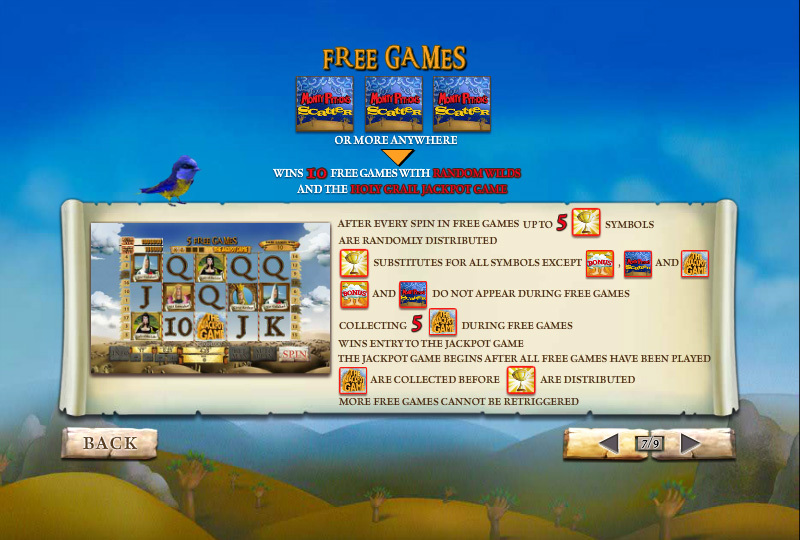 Players will have the chance to win the progressive jackpots after the free spins are complete. 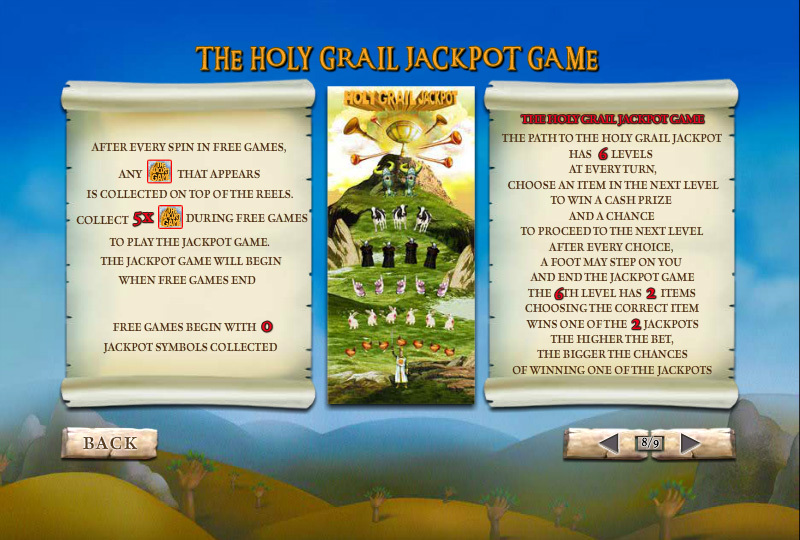 To win the Holy Grail jackpot, players will have to get five jackpot icons during the course of the free spins. If this happens, they will then have to play a jackpot game in which they could win the progressive amount. Play Monty Python’s Spamalot at any of these trusted Playtech Casinos.